// This doesn’t make any sense! 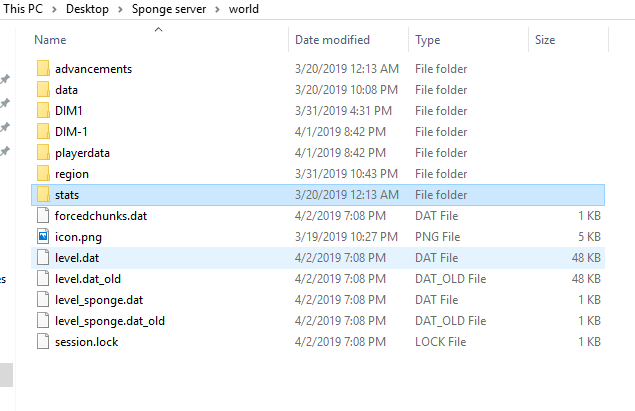 You should be able to fix this by deleting the level_sponge.dat file from your world directory. If there’s a file named level_sponge.dat_old, rename that to level_sponge.dat. If you have any backups of your world, replace level_sponge.dat with an old version. If you don’t have any backups, it should be OK to just delete it and restart the server. I did make a potential fix for this which will be in the next recommended build. It can’t correct the error once it happens, but it should prevent it from starting in the future. However, there have been some significant bugs in the recent latest builds; if you usually stick to the recommended builds, I wouldn’t suggest updating until the next recommended version. This is how inside of the world folder looks like. When I delete ones with old at the end it just creates the same at the end of the starting process which is when it stops working. I tried renaming it and it stil creates the “level_sponge.dat_old” file. Im not aware of a backup of my server since i made it a week ago and had no problems before this.